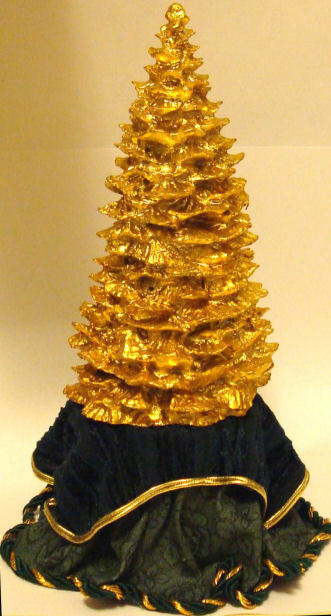 This rather over-the-top table was designed as a stand for this golden tree that will be in my Christmas Tree Shop. There are many tutorials on the web for making such tables, so I won't go into great detail here. However, here are some of my rather haphazard methods. 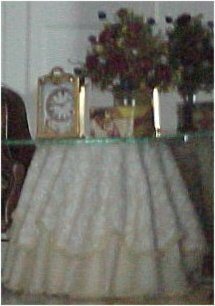 I have used everything from styrofoam and plastic cups to cut-down orange juice cans to make skirted tables, depending on what I had available at the time. This cut down juice can base, slightly over 2 1/2 inches tall, is years old and has gone through many skirt incarnations, which explains its rough appearance. I cut a cardboard circle to fit the top and used an emery board to smooth away old dried glue left on the edges. If you are using a cup with an indentation in the bottom, cut a circle to fit the open space to provide a smooth surface. 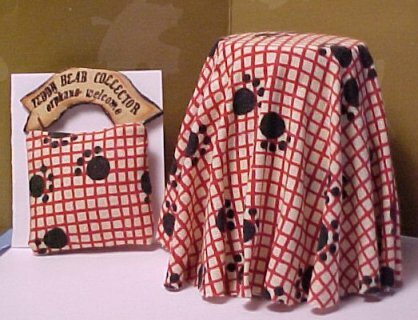 If your fabric is fairly light, it's a good idea to paint the base a matching color. Also, if anyone is likely to pick up your table to look underneath (and shame on them, but they are legion), I suggest covering the bottom with matching fabric before you add your skirt, bringing it up an inch or so above the bottom edge. 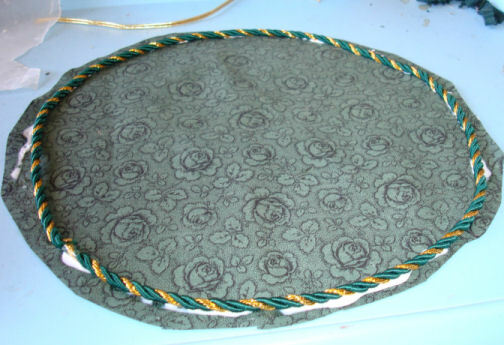 I sometimes lay a string from the bottom of the table base up and over the top down to the "floor" on the other side. This length becomes the diameter of your fabric. Of course, you can always measure with a tape, as well. 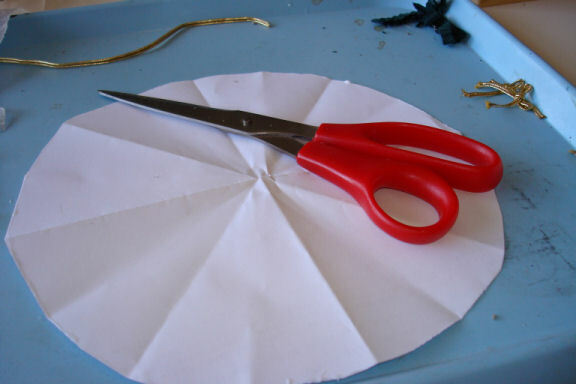 That measurement is used to make a paper pattern, folding and cutting. It is easier to add trims before draping, with the circle flat. On the other hand, I have been known to add trims afterward, too, pushing the glue-on-the-back trims or laces into the folds. In this case, the cording is heavy, as is the overskirt, so I decided it would be best to have it firmly in place before I started making the folds in the skirt. For some reason the cording looks to be a different color than the fabric, but it's really not. I left this to dry thoroughly, then used very sharp scissors to cut away the excess right against the cording. 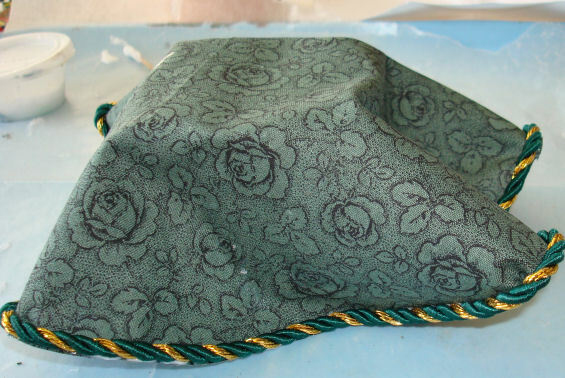 And, here again, the overskirt fabric also looks to be a different color, although it is actually very dark green. Here I have added another heavy cord to bind this piece, starting in the middle of one side. This way the join can be turned to the back, or hidden in a fold. Normally, I would not use anything that heavy, but I wanted a dramatic look for the Christmas tree table. When it was thoroughly dry, I trimmed very close to the cord with sharp scissors. Don't put glue on the top of the table. I usually put a wide strip all around it just under the top, and another wide strip at the bottom. 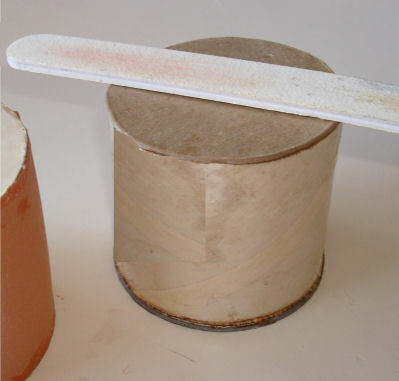 Press one bottom edge into the glue, then do the opposite side. Depending on the type of fabric you use, sometimes it's advisable to put a line of glue just above the bottom edge of the fabric circle, as well. Continue alternating this way, first the half, then the fourth, then the eighth, etc., until you get the number of pleats you want. If you coat the entire piece of fabric with glue, spreading it with an old credit card or piece of thin cardboard, and let it dry, then you don't have to worry about raveling or hemming. This also works if your fabric has some degree of synthetic in it; once the glue has dried, you are glueing to glue, which allows for easier draping. Cut your circle AFTER the glue has dried. I also find when I have done this pre-gluing, I can then use my scissors to trim any excess or even up the hem when the draped skirt is dry. In this case, I want the skirt to "puddle" on the floor so have deliberately left it a little long and because of the pre-attached cording, tried very carefully to keep it even. 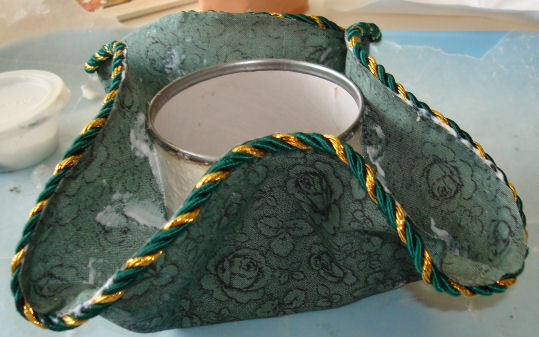 This is an example of using unconventional fabrics and trims for a special effect; standard natural fabrics are much easier to manipulate, of course. Both these tables are examples of the simplest form of skirted table; a plain circle glued to form natural-looking folds. In both cases, the print is a strong enough design element that further embellishment is not needed. 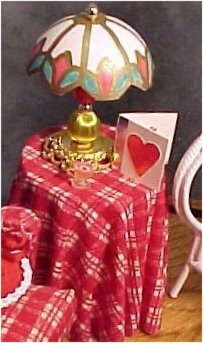 Notice, also, that the plaid tablecloth just touches the floor; the chicken print puddles. 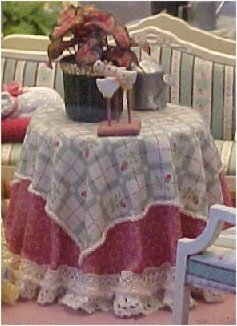 The chicken table is also an example of using a larger glass top to provide more surface area than the actual table. Putting a glass circle on top lends stability and allows more items to be placed without looking too cluttered. 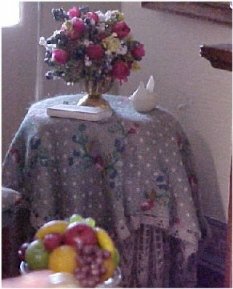 I tried this in miniature after doing it with a real skirted table in my living room. This is another simple table where the print is the predominant element. This one, made for a swap, belongs to a person who collects teddy bears. 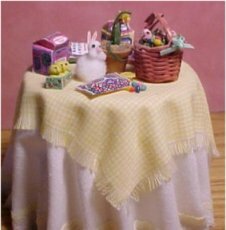 This is the basic tablecloth with a topper added. It is a square which has been fringed by pulling the threads away with a pin or needle. It's a good idea to draw a line of glue at the point where you want the fringe to end and let dry so you won't have further raveling. I don't always do this, however, since nobody's going to be taking this topper off anyway. Here is another fringed topper. 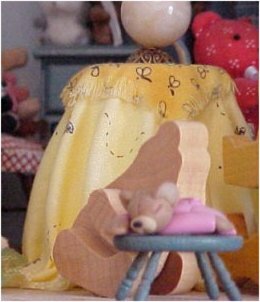 The underskirt has a bit of additonal trim, a strip cut from a wider piece of yellow lace. 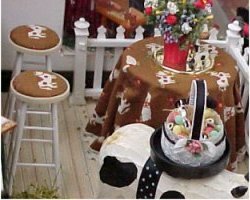 Here's a little table from the bears and honey shop which utilizes a short fringed topper. I love collecting coordinating little prints; should have enough to last me the rest of my life! Here's another example of a print that doesn't need much else, although I did add a strip of off-white trim at the bottom. Ironically, it doesn't really show when viewed through the front of the shop anyway. 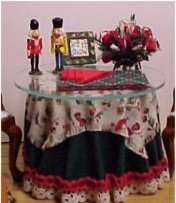 This tablecloth with fringed topper has had trims added at the bottom. The red came from the top of a lace strip and the white came from the bottom. The white was glued on first, then the red added to conceal the cut edge. Here are two subtle off-white coordinating prints. The overskirt was cut in a scallop shape. As I recall, it is a shorter circle, divided into halves, fourths and eighths and then circles cut from point to point. I think maybe I used the edge of a film canister to help mark the even circles. This trim is made by pulling bunka to curl it. 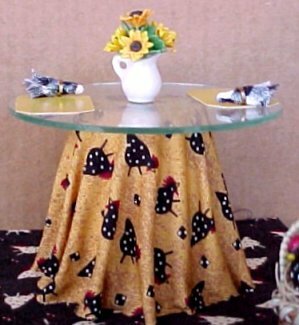 This little table has a lace underskirt. 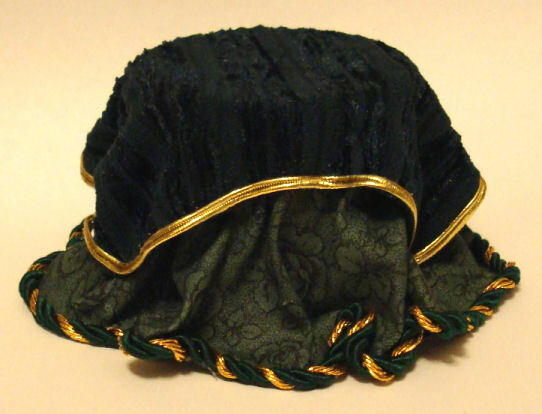 It has no top; it was just glued like a skirt around the edges of the cup. The topper has a lace strip glued underneath the edge. This one combines multiple trims; pulled bunka (pale pink) and off white lace strips. 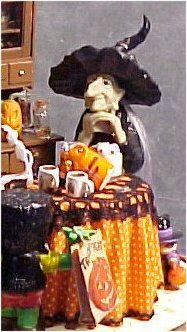 The witch's table utilizes pieces cut from a strip of black open lace which would normally be considered way over-sized. However, the openness reminded me of a spider web so I cut a small piece to make the topper; another glued piece covers the raw edges. One thin strip was also cut to trim the bottom of the skirt. 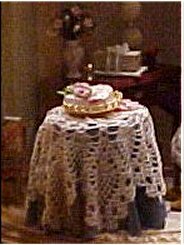 This anniversary table has a topper made of a lace doily. I just dipped it in a glue-and-water mixture, placed it within the folds of a towel and pressed out as much water as I could. It was then draped and pinned in place to dry. 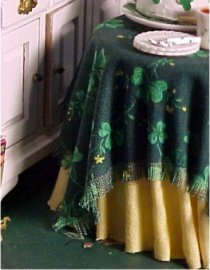 This little table is another example where the underskirt has no top. 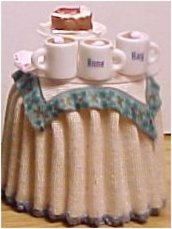 It was just a strip of ready-made wide trim pleated with a pleater, then glued around the top edges of the cup. The topper was cut from the same rustic ribbon. 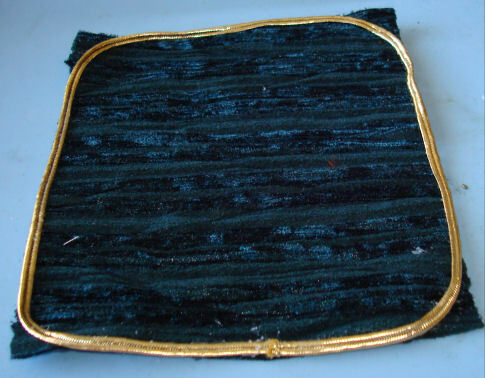 The trim was made by cutting a decorative stripe from fabric. This is another example of coating the back of fabric evenly with a very thin coat of glue, letting it dry, and then cutting. This way there is no raveling and avoids the thickness of a hem. This is another example of using a plastic circle to suggest a glass top. However, the circle is not quite big enough and everything on it makes it look too crowded. My goodness! I knew I liked skirted tables, but it surprised the heck out of me when I put these all in one spot. And this doesn't include the smaller scale tables or some which haven't been photographed.